New to my garden,is this delicate and tender plant. It is blooming right now under a sweeping double purple lilac tree in the front yard. 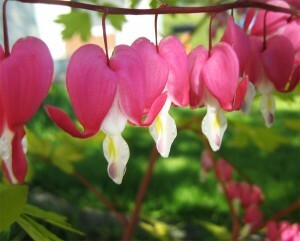 Bleeding Heart also goes by the name Lady’s Locket,Lady’s Heart,and Lyre Flower. If you bend back the little lyre-shaped petals it will reveal a tiny,slightly scandalous Lady in the Bath (another common name).